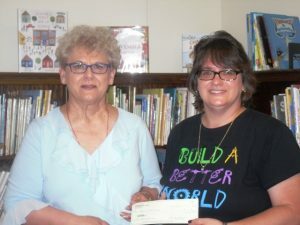 The Pleasant Valley United Methodist Church presented a check to the Joseph & Elizabeth Shaw Public Library to be used for children’s programs. Each month, the church takes a special donation to give to a local organization. Presenting the check is Sandra Bowser, treasurer of the Pleasant Valley United Methodist Church. On the right is Lisa Coval, the library’s youth services coordinator.